Amlodipine is a medication that can lower blood pressure. It is a calcium channel blocker with a long half-life, and therefore with a long-lasting effect. 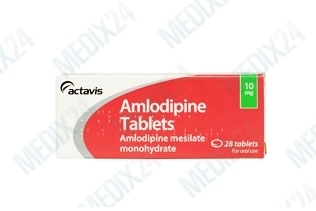 Amlodipine is prescribed to treat hypertension, but it is also used for treating and preventing attacks of angina pectoris and Prinzmetal’s angina. Used for treating: high blood pressure and angina pectoris. Effect: relaxes blood vessels, so that blood passes through the vessels more easily. Amlodipine relaxes your blood vessels, therefore allowing bloodflow to the heart and other vital organs to occur more fluently. The blood vessels relax because the Amlodipine blocks certain calcium channels by binding to a subunit. Therefore less calcium flows into the smooth muscle cells, thus the tone of the muscle is reduced. As a result, the heart muscle cells contract less powerful and consume less oxygen. The muscles relax more, which dilates the blood vessels and blood flow gets easier. In a normal dosage amlodipine affects most of the coronary arteries. How often should I take Amlodipine 5mg? You need to take Amlodipine only once a day, because of its long half-time. Warning: this medicine could affect your ability to drive or operate machinery.